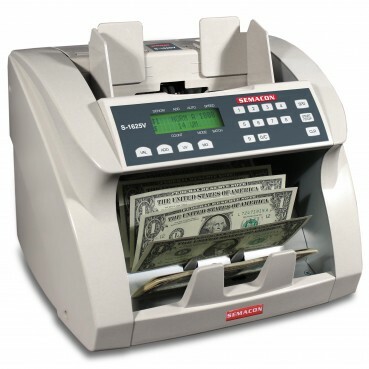 Bank grade two pocket currency discriminator for value counting and sorting mixed denominations including advanced counterfeit detection (UV, MG, FL, MT, IR) and batch stop setting. Color graphic touchscreen display and control panel. Compact design. Ultra high speed currency value counter for medium to very high level usage volumes including ultraviolet and magnetic counterfeit detection screening functions, value counting mode, 4 speed settings, batch stop settings, 10 button numeric keypad. Ultra high speed currency value counter for medium to very high level usage volumes including ultraviolet counterfeit detection screening function, value counting mode, 4 speed settings, batch stop settings, 10 button numeric keypad. 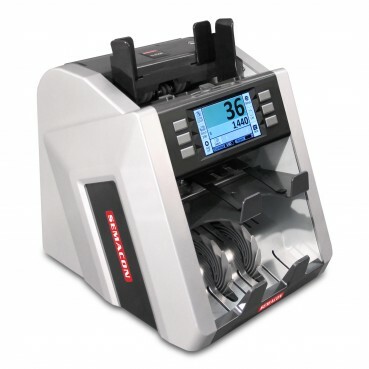 Ultra high speed currency value counter for medium to very high level usage volumes, value counting mode, 4 speed settings, batch stop settings, 10 button numeric keypad.